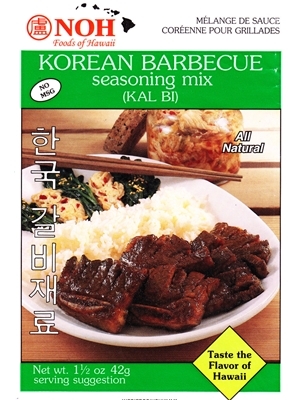 NOH Korean Barbecue Seasoning Mix (KAL BI) taste the flavor or Hawaii. Combine contents of package with 1/2 cup water and 2 tablespoons vegetable oil; blend well. Marinate short ribs for 4 hours. (For best results, marinate overnight). Cook as desired - barbecue, broil, pan fry, etc. For stronger flavor, substitute 1 tablespoon of sesame oil for the vegetable oil. Add 1/4 cup of diced green onions to make marinating sauce. Also, excellent for chicken, steak, hamburger, pork chops, turkey. Natural cane sugar, toasted sesame seeds, powdered soy sauce (wheat, soybeans, salt, maltodextrin) salt, garlic, powdered spices. Contains: Wheat, soy, and sesame seeds.